Back in the game! Tamiya collector Koenc saying hello. TOPIC: Back in the game! Tamiya collector Koenc saying hello. 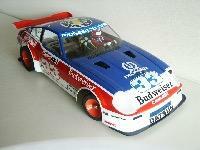 Well, David (Racing Master from TC in the time) is our representative for Tamiya in Belgium. He knew that Mr Tamiya would be there and so the idea rose to ask him to sign my Sand Scorcher. David did the same 15 years ago with his 934.